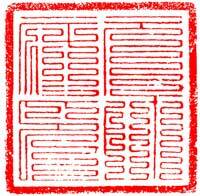 A glossary of terms used with Chinese-style seals. See Seal knobs for terms about the decoration on the top of seals. See Seal Materials for terms about the materials used in the making of seals. Contact us if you have any corrections or additions. Eight-fold zhuan script, in which vertical lines are folded back and forth to fill the available space. See also: jiu die wen. 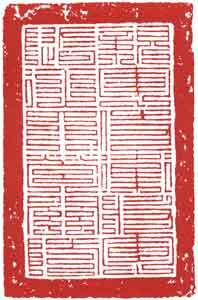 Literally “white writing.” A seal with white characters on a red background; sometimes referred to by the western art term intaglio. A half-squared seal, or half-size seal. 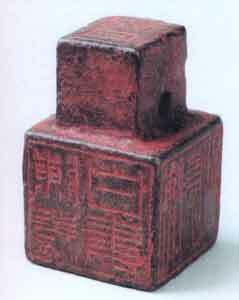 A rectangular seal used by lower ranking officials. 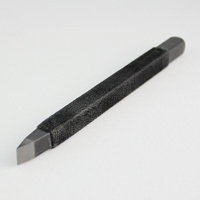 A graver (for engraving characters on a seal, etc. ); burin. See also: ke dao, tie bi, yin dao. A seal colophon, or side inscription on a seal stone. “Usually appears on the left side of the seal when the seal is held in the correct position for making an impression.” A side inscription, if long, will start on the left side and then continue to the left around the sides of the seal stone. The illustration shows a rubbing of a side inscription. A western term for the steel tool used for engraving. Sometimes used as a translation for the Chinese seal carving knife although the tools in east and west look nothing alike and are not used in the same way. 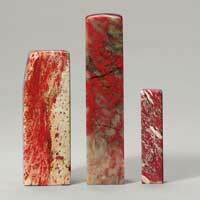 Can refer to any stone with red coloring, though the term usually refers to a variety of changhua stone. For more see: Seal Material. See also: ji xue shi. 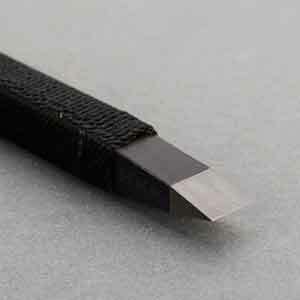 Swift knife/pushing cut, a seal-cutting technique. Bird and insect script (calligraphy). 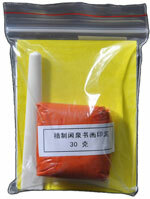 Often used on seals. 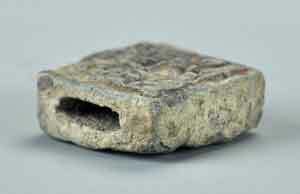 Rectangular seal carved on two sides with a hole between to thread a cord through. 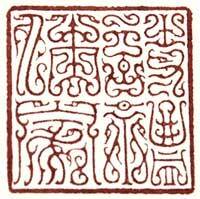 The illustration is a bronze seal from the Han dynasty. “Word” seals, as opposed to pictorial seals. (To) stamp with a seal. Literally “great seal”; the seal of power. Single knife. A seal-cutting technique. Knifework in the design of seals. See also: zhang fa, zhuan fa. 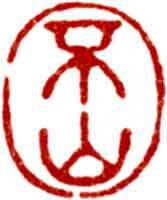 The Deng school of seal carving, founded by Deng Shiru (1743-1805). 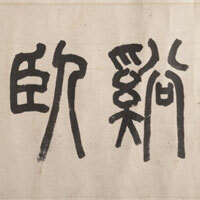 A type of calligraphy featuring characters twisting and turning like worms. 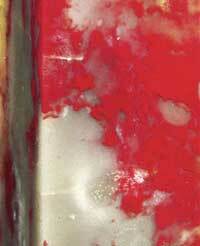 “Jelly,” refers to the shiny transparent look of a stone. See: xi ling ba jia. Square seal. The most common shape for a seal. 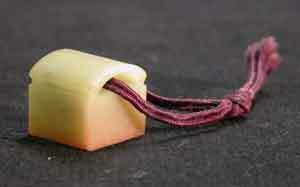 Silk ribbon traditionally attached to a seal. Ancient seal. 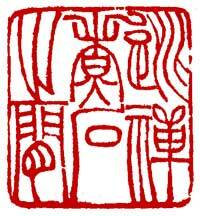 Usually refers to Han dynasty (206 BCE-220 CE) and older seals. Pre-Qin dynasty (221-206 BCE) script. Seal (the animal). This has absolutely nothing to do with Chinese seal carving. Seals using Mongolian characters. Popular in the Yuan dynasty (1260-1368). See also: yuan ya yin. The Hui school of seal carving. 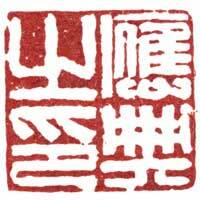 This term is often used for yinwen/baiwen seals. 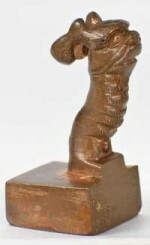 A western art term referring to a raised background with subject carved out. We should stop using this term for seal carving as it confuses almost everyone. 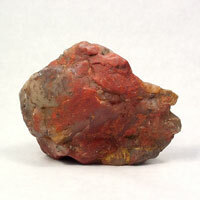 Refers to the transparent look of a stone. Haste seal; literally: urgently improvised seal. 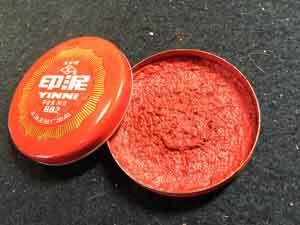 Often made by the military in ancient China where an officer might need to be quickly promoted. 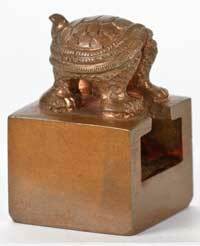 Blank bronze seals were sometimes brought along on campaign just for this purpose. 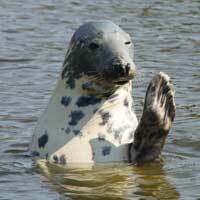 Some modern seal carvers imitate their clumsy look. 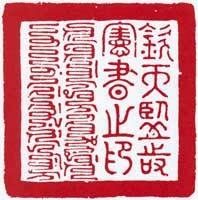 Seals with propitious phrases/auspicious words. Nine-fold/bend script, in which lines are folded to fill up the available space. 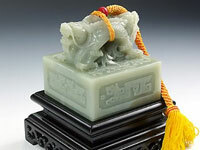 Created after the Southern Song dynasty (1127-1279), primarily for official seals. See also: ba die zhuan. Engrave. See also: zhuan ke. 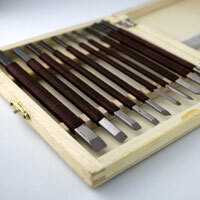 Carving knife, burin, graver, seal-cutting knife. See also: bi dao, tie bi, yin dao. 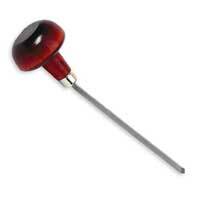 Carve a chop; engrave a seal. Carve characters [on seals, etc.]. Twin seals; two seals carved on the same stone. Often with one baiwen and one zhuwen. Willow leaf zhuan script. A style of zhuan script writing used with seals where both ends of the strokes taper to a point. Sinuous seal script. 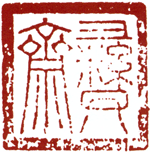 The most common script style found in Han dynasty (206 BCE-220 CE) seals. The name comes from the way strokes can be twisted or altered to fit the design. See also: yin shou zhang. Chopping cut, a seal-cutting technique. Also called relief carving. 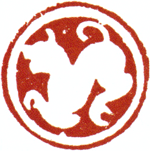 Often used when referring to yangwen/zhuwen seals. A western art term meaning a raised surface with the background carved out. We should stop using this term for seal carving as it confuses almost everyone. 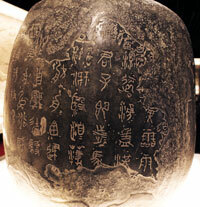 Stone drum script, used on seals and named for the ancient drum-shaped stones on which the calligraphy was engraved. Transitional between dazhuan and xiaozhuan scripts. The illustration shows one of these stone drums. Silk ribbon attached to an official seal. 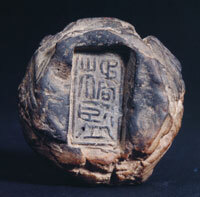 Collection seal; usually with the name of the art collector. Characterized only by the text and not by the style. See also: zhai shi yin. “Double knife,” a seal-cutting technique. Four-sided seal with a hole through the center. 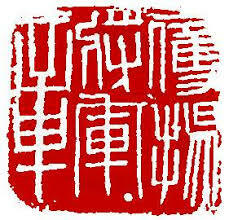 The four perfections: poetry, calligraphy, painting, and seal carving. “Iron brush,” the chisel used in seal carving. See also: bi dao, ke dao, yin dao. Iron seal/stamp. An uncommon material for seals. Oval seal. See also: chang yuan yin. Elliptical seal, somewhat like a rectangular seal. 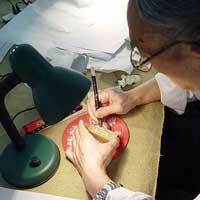 The Wan school of seal carving. Eight Masters of Xiling: Chen Hongshou, Chen Yuzhong, Ding Jing, Huang Yi, Jiang Ren, Qian Song, Xi Gang, and Zhao Zhichen. All active in Zhejiang province. Imperial seal and attached cord. 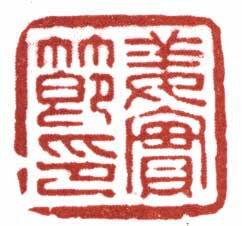 Official and private seals used, up to the Qing dynasty (1644-1911), as a means of authentication. See also: gu xi yin. Leisure seal/private seal usually containing an idiom or poetic quotation. Seals with animal figures; pictorial seals. Literally: small seal script, as opposed to the earlier large seal script. Commonly used on seals. Suspended needle seal script. 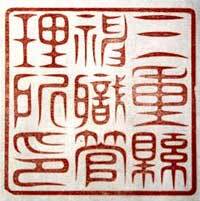 Said to have been created by calligraphers Shi Weize and Qu Lingwen during the Tang dynasty (618-907). Sometimes used on seals, with thick verticals tapering to a point at the bottom. Bottom corner seal/balancing corner seal; usually square. 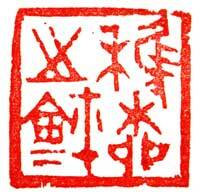 “Yang writing” or “positive” seal; seal with red characters on a white background. Seal handle, an elongated handle on ancient bronze seals. 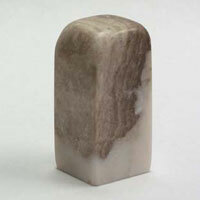 Seal material, uncut seal stone. See also: bi dao, ke dao, tie bi. 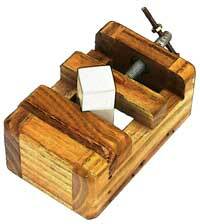 Literally a “seal bed,” a vise used to hold seals while carving. Seal rule, used to help position a seal when stamping a work of art. 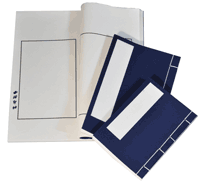 Inkpad, container for seal ink. A book of seal impressions. Blank books are sold for this purpose. “Foremost seal,” colophon-head seal, upper right-hand corner seal; usually oblong. See also: qi shou zhang, ying shou zhang. 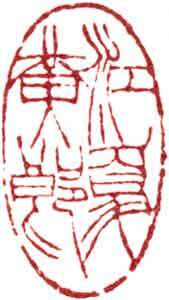 “Yin writing” or “negative” seal, seals with white characters on a red background. 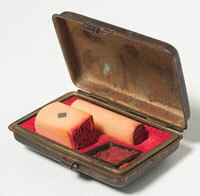 Seal case, or a box for holding seals. The general term for seals. The study of seal engraving. “Seal chopsticks,” a paddle used to stir the seal ink paste. Steel is discouraged (though I don’t know why). 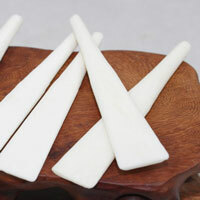 Antique ones are sometimes made from ivory, modern ones from bone or plastic. “Leading seal,” upper right-hand corner seal; usually oblong. Jade chopstick seal script. Said to have been created by calligrapher Li Yangbing during the Tang dynasty (618-907). 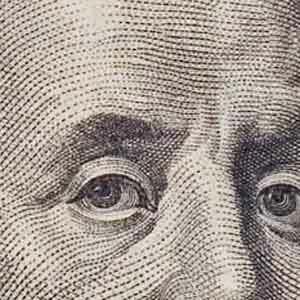 Sometimes used on seals, with thick squared-off white characters on a dark background. Seals using Mongolian characters. Popular in the Yuan dynasty (1260-1368) when the Mongols ruled China. Sometimes with both Mongolian and Chinese characters, as in this example. See also: hua ya yin. Round-relief script. Thin rounded red characters on a white background. In use since the Song and Yuan dynasties (960-1368). See also: shu zhai ming yin. 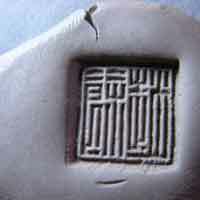 The art of composition in the design of seals; one of the three skills of seal carving. See also: dao fa, zhuan fa. 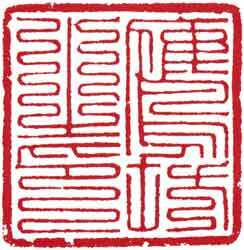 The Zhe school of seal carving, founded by Ding Jing (1695-1765). 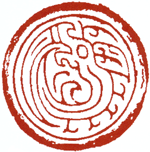 Motto seal (zhenyan = maxim, precept). “A variation of xiaozhuan with strokes with bifurcate ends.” The “v” shaped ending on a stroke is the result of the double-cut technique, without squaring off the ends of the stroke. A seal with both red and white characters. 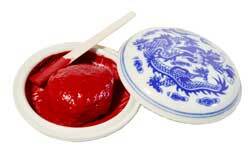 Cinnabar paste for seal imprints; seal ink. 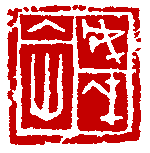 “Red writing,” a seal with red characters on a white background. The calligraphic aspect of seal design; seal character writing technique; one of the three skills of seal carving along with zhangfa and daofa. See also: dao fa, zhang fa. 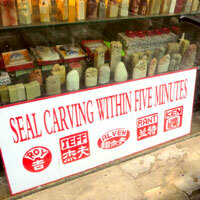 A person who carves seals. 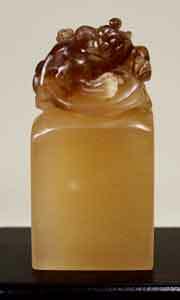 “Mother and child seal” with one or more small seals nested inside a larger one. This example, from the Freer/Sackler Galleries in Washington, DC has the body of the tortoise as one seal and the head and neck as another, smaller seal.